"Zero" was the first Easy 32 constructed. Eight years later, the builder is still living aboard, and has sailed up and down the Queensland coast several times. 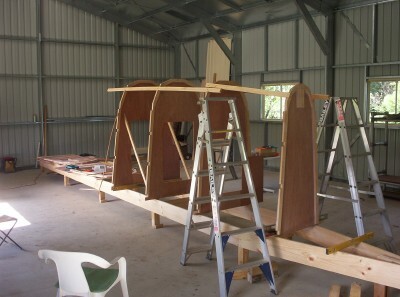 This pic shows the strongback in the centre of the shed and some of the frames standing on it. This is the port hull. Went sailing on Papillion for the afternoon. Weather was too nice to be boatbuilding. Now the Shed's completed, it's time to start boat building. It's important to be able to work under cover. Here's a pic of where the shed is being built.